If you've read a few of my previous posts (Changing to Cloth Nappies), you'll know that I am a cloth nappy lover. I switched over as they are better for the environment and I could save a bit of money. So when an email pinged into my inbox asking if I'd be interested in reviewing Naty, a greener disposable nappy, I was intrigued. Naty by Nature Babycare is a entrepreneurial company founded by Marlene Sandberg, a Swedish mother. Their products are a natural choice for environmentally aware parents and women. 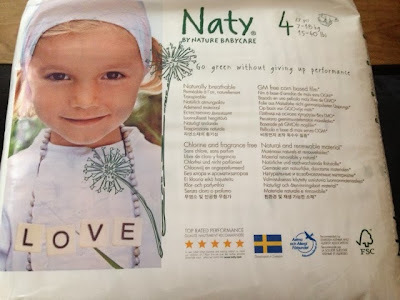 Naty nappies are made from natural, renewable, biodegradable materials. On average, a baby from birth to potty will get through approximately 4,500 disposable nappies and as a nation the UK deals with the disposal landfill of nearly 3 billion used nappies every year (8 million a day!) at a cost of £40 million. Plus, it takes standard disposable nappies a whopping 500 years to decompose! 3) Chlorine Free outer cover. No plastic. 4) Leakage barrier made of natural material. GM free based corn film. No plastic. 5) Distribution layer made of natural material. No plastic. 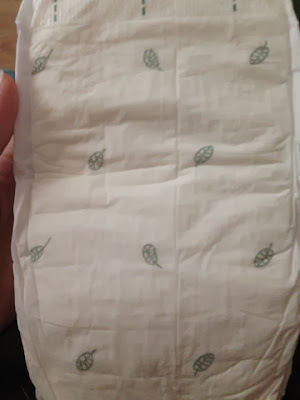 The first thing that I noticed about these nappies upon opening was the texture (and the cool leafy pattern). I am used to the plastic feel of a regular disposable but these are maize starch and cellulose fibre which felt like paper! I was dubious as it was something that I wasn't used to but really, there is no difference to how they work! They nappies work in exactly the same way. Why can't all disposable nappies be like this? The Naty nappies also fitted really well too. We had no leaks, C seemed comfortable and he didn't develop nappy rash. I think I've been won over! You can find out more about Naty at their website, Facebook and Twitter.